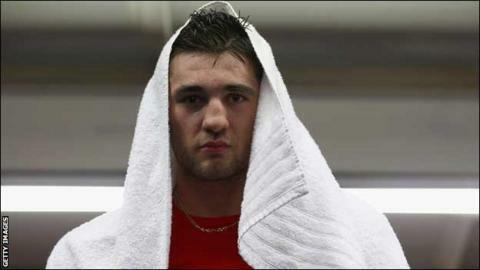 Nathan Cleverly has promised to be the model professional ahead of his WBO light-heavyweight title defence and restore class back into British boxing. Cleverly fights American Tommy Karpency on Saturday and he wants to repair boxing's reputation after the Dereck Chisora and David Haye controversy. They after Vitali Klitschko beat Chisora in a WBC heavyweight title bout in Munich. Cleverly said: "People are going to be looking for people to lead by example." The Welshman added: "I have a chance to do that, conduct myself in a professional manner as always and leave my talking for inside the ring not outside." Boxing has been in the headlines for all the wrong reasons this week and Chisora, who was arrested by German police before being released after questioning, also slapped Klitschko ahead of the bout. Chisora also spat water in the face of Klitschko's brother Wladimir, and faces a British Boxing Board of Control hearing next month because of his behaviour in Munich. German police, meanwhile, remain keen to talk to former WBA heavyweight champion Haye over his role in the incident. The controversy has cast a cloud over Cleverly's final preparations for his meeting with Karpency at the Motorpoint Arena in Cardiff. And the undefeated 25-year-old, British boxing's only current world champion, says he will continue to conduct himself in a mature, professional fashion ahead of his third title defence. "It can be easy to get dragged into a scuffle," said Cleverly. "But I am pretty sure that is not going to happen, we will have the utmost respect for each other. "People will be looking for me to carry the sport in a professional manner, which I intend to do. I will be myself and I am sure it will be a professional performance. "Karpency seems to be a good guy, he is a professional fighter, he seems a nice guy so I don't see a clash of personalities that will cause uproar." Cleverly was involved in an explosive press conference with Tony Bellew, where the pair squared up when they were due to meet for the WBO belt last May. The Welshman went on to beat Bellew in his second defence in October but Cleverly said, unlike events in Germany, he and Bellew were in control of their aggression. He said: "When you are disciplined it is straightforward [to keep control of your emotions]. "You leave your aggression for the gym and for fight night. Sometimes there is a clash, with me and Bellew we were both unbeaten and we both thought we were the best. "We said things which wound the other up, and it flew off the handle a little bit, but it was controlled aggression and it did not go over the top. "It created a lot of hype around the fight. I enjoyed it because it was different and I am sure Tony Bellew enjoyed it at times." Cleverly, fighting on Welsh soil for the first time in four years, is the overwhelming favourite to defeat challenger Karpency and retain his belt.